The constitution cannot be unconstitutional. It follows therefore that one part of the constitution cannot be used to strike down or nullify another part of the constitution. This tautology, fittingly, sounds very obvious and simple – yet it still bears repeating with respect to the Constitution of Canada, a confounding Cherub (like that in the Book of Ezekiel) composed of disparate, even contradictory, parts that ought not fit together yet must fit together and reconcile with one another. On 10 September 2018, Justice Belobaba of the Ontario Superior Court of Justice struck down the provisions of the Better Local Government Act reducing the size of Toronto City Council by half and using the federal and provincial electoral districts as the basis for the City of Toronto’s new wards, as unconstitutional; Premier Ford, in turn, announced that the government will introduce a bill re-acting these provisions under the Notwithstanding Clause. This recent controversy has brought to the fore an interesting and perhaps unique feature of Canadian constitutionalism: all parts of the Constitution of Canada are constitutional, but some parts are more constitutional than others. Ultimately, I believe that this confused and contradictory view of the Constitution of Canada flows from two of its features: first, the fact that it is a hybrid of both codified elements and uncodified principles and conventions; and second, because the five amending formulas within Part V of the Constitution Act, 1982 do decline along a hierarchy of high threshold and high veto potential to low threshold and no veto potential, in other words, from the unanimous, to the multilateral, to the bilateral, and, finally, to the unilateral. 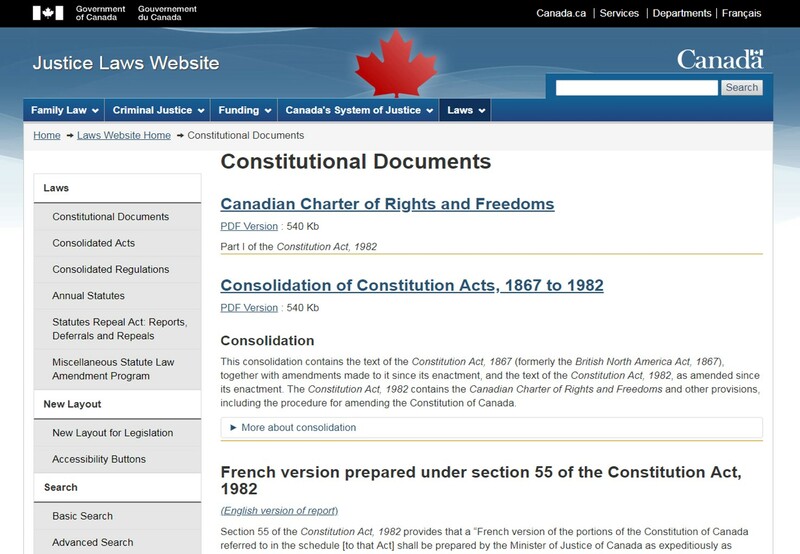 Today, the “Constitution of Canada” consists of a non-exhaustive mixture of codified elements – the Constitution Acts, 1867-1982 themselves, the 30 British and Canadian statutes and executive instruments in its schedule, and other non-enumerated statutes – and uncodified constitutional conventions and constitutional principles. Part V of the Constitution Act, 1982 outlines the five classes of amending formulas, the subject-matter and constitutional provisions to which each applies, and two methods (resolution and proclamation on the one hand or statute on the other) by which these amendments are promulgated. Together, these amending formulas cover any and all amendments to the text of the Constitution Acts – they are exhaustive. The General Amending Formula, outlined in section 38 as the default formula and again in some specific cases in section 42, requires concurring resolutions from the House of Commons and Senate and at least 7 provincial assemblies which combined represent at least one-half of Canada’s population. The Unanimity Formula requires concurring resolutions from all 10 provincial legislatures and the House of Commons and Senate. The Section 43 Formula applies to matters that affect some but not all ten provinces and involves concurring resolutions by the House of Commons, Senate, and the legislative assemblies of the provinces concerned. These three “multilateral procedures,” which rely on concurring resolutions of legislative bodies and not acts of Parliament or a provincial legislature, are then promulgated into force through a proclamation issued by the Governor General on the advice of cabinet. The Section 44 Formula allows the Parliament of Canada alone, through a normal statute, to alter constitutional provisions “in relation to the executive government of Canada or the Senate and House of Commons”, and the Section 45 Formula likewise allows the provincial legislatures to “exclusively make laws amending the constitution of the province” by statute. But only the multilateral procedures, ratified by legislative bodies and promulgated by proclamation qualify as “opening the Constitution.” For instance, in 2011, the Parliament of Canada passed a statute called An Act to Amend the Constitution Act, the Canada Elections Act, and the Electoral Boundaries Readjustment Act under the Section 44 Procedure – yet its status as a constitutional amendment received little fanfare, and no one described it as an example of “opening the Constitution.” This hierarchy of amending formulas in turn reflects the fact that the Constitution of Canada has always included both the federal and the provincial constitutions within them – another contradiction which the US Constitution and the Constitution of Australia avoided – which is why some matters within the constitution can be changed by the Parliament of Canada or provincial legislatures alone, why some involve the federal order of government and some but not all provinces (and potentially only one province), and why some involve all provinces or touch upon general concern. The amending formulas weight elements and allow efficiencies where they should reasonably occur in matters of particular concern. The five different methods of amending the Constitution of Canada makes some parts of the constitutional more constitutional than others. And so, too, crucially, does the duality that lies at its heart, which strikes at the very definition of “constitution.” In 1917, William Renwick Riddell, then a Justice of the Supreme Court of Ontario, explained to an American audience the differences between the classical, or English, versus the modern, or American, concept of the “constitution.” He described “the constitution, in the English sense” as “the totality of the principles more or less vaguely and generally stated upon which we think the people should be governed,” while the “constitution in the American sense” refers to “a written document […] which authoritatively and without appeal dictates what shall and what shall not be done.” Riddell added that under the “constitution in the English sense,” an action could be legal but unconstitutional, while in the American sense, that which is unconstitutional is also necessarily illegal. The classical and British view of the constitution ultimately derives from the Ancient Greeks’ idea of nomos, often ambiguously translated as “law.” Nomos refers to the sum total of human conventions, customs, norms through which the citizens of a polis govern themselves, as well as to “the tradition of law”, or the rule of law itself, and not merely to written statute laws. In contrast, constitution in the American sense comes from the Enlightenment tradition of the late 18th century and did much to shape the word as generally understood today. Codifying a constitution as supreme law – a radical act in and of itself – rejected the Bodinian-Blackstonian idea of sovereignty and allowed the United States to set up a division of powers between two orders of government and enshrine popular sovereignty animating both orders of government as a replacement of legislative sovereignty. Canada and Australia later drew federalism from the American experience but did not adopt the US system entirely. [C]onstitutional conventions plus constitutional law equal the total constitution of the country. However, the Supreme Court broke down the “Constitution of Canada” into separate categories and differentiated between the “law of the constitution,” which are justiciable and on which the courts can adjudicate, and the “rules of the constitution” or “requirements of the constitution,” which are not justiciable but are instead politically enforceable. The two categories correspond to what Riddell called the American and English conceptions of the “constitution.” The courts should therefore, at least in theory, only acknowledge the existence of a constitutional convention, but they could not attempt to enforce a judicial remedy in response to the violation of a constitutional convention. For instance, the Federal Court ruled in Conacher that “votes of non-confidence are political in nature and lack legal aspects” and that therefore the Prime Minister, not the courts, would judge whether the Government had lost the confidence of the Commons. The Supreme Court classified the constitutional conventions associated with Responsible Government – such as the confidence convention – under the latter, non-justiciable category of “rules of the constitution.” The Supreme Court thus seems to have established two orders of the Constitution of Canada in which the “law of the constitution” ultimately trumps the “essential rules of the constitution” – if only because the courts cannot enforce the latter category. [W]hile they are not laws, some conventions may be more important than some laws. Their importance depends on that of the value or principle which they are meant to safeguard. Also they form an integral part of the constitution and of the constitutional system. [. . .]. That is why it is perfectly appropriate to say that to violate a convention is to do something which is unconstitutional although it entails no direct legal consequence [emphasis added]. The Constitution implements a structure of government and must be understood by reference to “the constitutional text itself, the historical context, and previous judicial interpretations of constitutional meaning.” […] The rules of constitutional interpretation require that constitutional documents be interpreted in a broad and purposive manner and placed in their proper linguistic, philosophic, and historical contexts. […] The assumptions that underlie the text and the manner in which the constitutional provisions are intended to interact with one another must inform our interpretation, understanding, and application of the text. The Supreme Court of Canada also acknowledged in the Secession Reference that the Supremacy Clause, section 52(2) of the Constitution Act, 1982, is not exhaustive and therefore “includes” statutes not enumerated in the schedule, as well as constitutional principles and conventions. The Supreme Court of Canada reaffirmed this ruling in the Senate Reform Reference of 2014. The ‘Constitution of Canada’ certainly includes the constitutional texts enumerated in s. 52(2) of the Constitution Act, 1982. Although these texts have a primary place in determining constitutional rules, they are not exhaustive. […] These supporting principles and rules, which include constitutional conventions and the workings of Parliament, are a necessary part of our Constitution because problems or situations may arise which are not expressly dealt with by the text of the Constitution. In order to endure over time, a constitution must contain a comprehensive set of rules and principles which are capable of providing an exhaustive legal framework for our system of government. Section 52 does not provide an exhaustive definition of the content of the Constitution of Canada. Through four major reference cases from 1981 to 2014, the Supreme Court of Canada has perhaps unwittingly set the stage for a colossal legal and political struggle in this country. The legally enforceable “laws of the constitution” correspond to Riddell’s “constitution in the American sense”, while the “rules of the constitution” – uncodified normative conventions – refer to what Riddell called the “constitution in the British sense.” Sometimes it seems that the two contradict each other, which presents a conundrum, because only the laws of the constitution are justiciable, meaning that the rules of constitution would win by default simply by not being subject to judicial review. This is why (contrary to what many lawyers and judges believe and would like to be true) the courts do not hold a monopoly on constitutional interpretation and cannot insert themselves into matters of politically enforceable conventions – yet. These are currently left to historians and to the politicians themselves. But this state of affairs might not continue indefinitely. Just as the United States Supreme Court gave itself the authority of judicial review and the capacity to strike down statute laws repugnant to the US Constitution through the Malbury v Madison case in 1803, it is not inconceivable that the Supreme Court of Canada might one day unilaterally expand the scope of judicial review in this country and claim unto the judiciary the authority to adjudicate the rules of the constitution and the application of constitutional conventions and other matters hitherto only politically enforceable. Several preliminary points should be made clear before I explain why the Impugned Provisions infringe s. 2(b) of the Charter. The only proviso, and it is an important one, is that any such legislation must comply with the Charter (and, arguably, any applicable unwritten constitutional norms and principles). As long as a statute is “neither ultra vires nor contrary to the [Charter], courts have no role to supervise the exercise of legislative power.”4 The remedy for bad laws that are otherwise intra vires and Charter-compliant is the ballot box, not judicial review. Justice Belobaba did not base his ruling on these grounds of unwritten constitutional norms and principles. But it would not be surprising if Canadian courts eventually tried to claim or unilaterally asserted the authority to enforce “any applicable unwritten constitutional norms and principles” and the “rules of the constitution” simply on the grounds that political enforceability does not suffice at safeguarding these uncodified norms and that only the courts could do so. But a certain logic could underpin the idea. Section 52 of the Constitution Act, 1982 defines the Constitution of Canada as supreme law, and the Supreme Court has recognized in several reference cases that the Constitution of Canada – supreme law – “includes” things not enumerated and codified within the Constitution Acts and their schedules. This raises the question of which body could adjudicate such matters; the only plausible answer is the courts. Our democratic government consists of several branches: the Crown, as represented by the Governor General and the provincial counterparts of that office; the legislative body; the executive; and the courts. It is fundamental to the working of government as a whole that all these parts play their proper role. It is equally fundamental that no one of them overstep its bounds, that each show proper deference for the legitimate sphere of activity of the other. The Supreme Court re-affirmed this doctrine of the separation of powers relating to judicial independence and parliamentary privilege in subsequent cases. The Notwithstanding Clause is therefore best understood as unique Canadian innovation to the separation of powers and checks and balances. The legislatures – the elected assemblies of which represent the constituent authority of the body politic of the realm, the people – should exercise their check against the courts more often as a matter of principle. If judicial rulings can legitimately be challenged within the overall constitutional architecture, whether on appeal to a higher court or through the Notwithstanding Clause, then these checks and balances should not be written off or stridently dismissed. After all, the separation of powers does not merely grant the judiciary its judicial independence; it also preserves the autonomy and integrity of executive authority and legislative sovereignty. The Notwithstanding Clause should be regarded as part of an overall guiding philosophy within The Charter. This become more clear in contrast to the system in the United States. The Bill of Rights of the United States Constitution strictly forbids Congress from enacting laws restricting certain enumerated liberties of American citizens in the form “Congress shall make no law […].” In Malbury v Madison, the United States Supreme Court established judicial review based on what it regarded as the logical extension of the separation of powers and checks and balances; in so doing, it claimed an authority for the courts to strike down, nullify, and invalidate statute laws and executive orders as unconstitutional as a check and balance against Congress and the President. In the United States, both the prohibition on Congress from enacting statutes repugnant to the US Constitution and the Supreme Court’s judicial reviews are final and absolute. For instance, only a constitutional amendment could take away the freedom of expression in general or overturn the Supreme Court’s ruling in Texas v Johnson so that Congress could criminalize burning the Star-Spangled Banner in particular. The Simpsons (in its last unambiguously excellent season 7) parodied School House Rock’s “I’m Just a Bill” with this “I’m an Amendment-to-Be.” Why can’t Congress simply pass a law banning flag-burning? “Because that law would be unconstitutional – but if we change the Constitution […],” says the prospective constitutional amendment. But in Canada, if the courts found a statute unconstitutional and ultra vires of section 2(b) of the Charter, which guarantees the freedom of expression, then the Parliament or the legislature, as the case may be, could restore the impugned statute with the Notwithstanding Clause. The Canadian Charter of Rights and Freedoms eschews absolutism and instead builds in checks and balances and flexibility into the Constitution of Canada – especially through Section 1, The Reasonable Limits Clause, and Section 33, the Notwithstanding Clause. Section 1 immediately qualifies rights and freedoms in Canada. Under some circumstances (now governed by the Oakes Test), the executive and legislature can violate individual rights; the legislature can also restore, for a period of five years, a statute or statutory provision which the courts have struck down as unconstitutional, provided that the ruling does not pertain to sections 2 and 7 through 15 of the Charter. These provisions build in new checks and balances into the Constitution of Canada and allow the executive and the legislature to push back against the judiciary and its authority of judicial review. The Notwithstanding Clause partially restores balance by allowing legislatures to make a counter-move against judicial review and temporarily assert legislative sovereignty. Section 33 of the Charter of Rights and Freedoms should not be regarded as an aberration somehow not part of the Constitution of Canada. Instead, it provides a crucial check and balance to the legislatures against the judiciary. Section 2 of the Charter enumerates “Fundamental Freedoms”; sections 7 through 14 pertain to “Legal Rights,” and section 15 codifies “Equality Rights.” If the courts strike down statutory provisions on the grounds that they are repugnant to anything within sections 2, 7, 8, 9, 10, 11, 12, 13, 14, or 15, then this section 33 (known as “The Notwithstanding Clause” even though it in fact consists of several clauses) the Parliament of Canada or a provincial legislature can pass a statute reaffirming the old provisions notwithstanding the court’s ruling. This notwithstanding statute would automatically expire after five years – the maximum life of a parliament or legislature under section 4 of The Charter – though the next parliament or legislature could reenact the legislation for another five years, and so on. In this manner, the Notwithstanding Clause reinforces the old British tradition of parliamentary sovereignty and implements the old adage that “one parliament cannot bind another” through the sunset clause of mandatory and automatic expiration under section 33(3). This, in turn, reinforces checks and balances by forcing each individual parliament or legislature to re-consider what its predecessors enacted. From 1982 to 1985, the Legislature of Quebec routinely invoked Section 33 as a pre-emptive application and, at least when the Parti Quebecois formed government between 1982 and 1985, as an ironic gesture of defiance against the Charter. Robert Bourassa’s Liberals came to power in 1985. The Legislature of Quebec had to apply the Notwithstanding Clause to An Act to Amend the Charter of the French Language in 1988 against the Supreme Court of Canada’s ruling in Ford v Quebec, which had struck down provisions pertaining to unilingual French signage. In 1993, once the provincial statute invoking the Notwithstanding Clause had automatically expired, the Bourassa government opted not to renew the exemption and instead made the new provincial statute comply with the Supreme Court’s ruling from 1988. The Bourassa government’s use of the Notwithstanding Clause has seared itself into the English-Canadian consciousness and explains the vehement hatred that English-speaking liberals now hold toward the Notwithstanding Clause in principle. While they would expect such policies from a Parti quebecois government, English-speaking Canadian federalists probably also say what the Liberal government of Robert Bourassa did as a betrayal. The Parliament of Canada has thus far never invoked the Notwithstanding Clause. Yukon’s territorial legislature used the Notwithstanding Clause once, in 1982, on a piece of legislation called the Land Planning and Development Act. And interestingly, Saskatchewan has now, as of 2018, employed Section 33 twice, first in 1986 in back-to-work legislation and again in 2018 in the School Choice Protection Act, which pertains to funding for Catholic schools — a perennial Canadian political issue. Perhaps the Legislature of Saskatchewan’s use of the Notwithstanding Clause earlier this year received no national media coverage because the statute did not pertain to the City of Toronto, well known to be the Centre of the Universe. 2.2(1) Pursuant to subsection 33(1) of the Canadian Charter of Rights and Freedoms, section 2.1 is declared to operate notwithstanding sections 2 and 15 of the Canadian Charter of Rights and Freedoms. Taken together, these precedents show that legislatures can invoke Section 33 either pre-emptively in order to prevent any Charter challenge or retroactively in response to a successful Charter challenge. At first glance, Bill 5 although controversial in content appears to fall squarely within the province’s legislative competence. Upon closer examination of the surrounding circumstances, however, one discovers at least two constitutional deficiencies that cannot be justified in a free and democratic society. The first relates to the timing of the law and its impact on candidates; the second to its content and its impact on voters. As I explain in more detail below, the Impugned Provisions breach s. 2(b) of the Charter in two ways: (i) because the Bill was enacted in the middle of an ongoing election campaign, it breached the municipal candidate’s freedom of expression and (ii) because Bill 5 almost doubled the population size of City wards from an average of 61,000 to an average of 111,000, it breached the municipal voter’s right to cast a vote that can result in effective representation. Either breach by itself is sufficient to support a court order declaring that the Impugned Provisions are of no force or effect. Belobaba transferred the Supreme Court’s earlier argument from Saskatchewan Reference about “effective representation” flowing from section 3 of the Charter to a question of freedom of expression under section 2(b). This is because section 3 pertains only to the right to vote in federal and provincial elections, but not in municipal elections. The Supreme Court first ruled on this issue in Saskatchewan Reference in 1991 and found that “effective representation” relates to the Electoral Boundaries Readjustment Act, the decennial redistribution of seats to the provinces in the House of Commons, and how the electoral boundaries commissions within each province draw the boundaries between ridings. Effective representation means that the variance in population between electoral districts cannot exceed 25%, apart from other limited circumstances now specified in the Electoral Boundaries Readjustment Act, like communities of interest, or simple geographic and logistical realities which affect sparsely populated northern ridings. In 2011, the Parliament of Canada passed a constitutional amendment under the Section 44 Amending Procedure to section 51 of the Constitution Act, 1867, which defines the formula determining the number of MPs by each province is represented in the House of Commons. The new baseline stipulates that the maximum number of persons per electoral district should be around 111,000, which means that most MPs in the House of Commons represent around 111,000 persons. (Of course, the formula spells out the necessary exceptions like the Senate Floor Rule and a grandfather clause for Quebec, which means that Ontarians are under-represented compared to the rest of the country). Under the Fewer Politicians Act of 1996 – one can’t help but enjoy Premier Harris’s names for statutes! – Ontario alone amongst the provinces decided to link its redistribution of seats and boundaries of electoral districts in its provincial legislature to the boundaries of Ontario’s federal electoral districts in the House of Commons (apart from an exceptional, additional seat for northern Ontario). The Ford government’s legislation from this year which reduced the size of Toronto City Council from 47 to 25 councillors then, in turn, tied the wards in Toronto’s smaller council to Ontario’s federal and provincial electoral districts. Torontonians would thus be represented in the federal House of Commons, provincial Legislative Assembly, and municipal council along the same electoral districts. On the basis of the evidence before me, I find that the Impugned Provisions (that impose a 25-ward structure with an average population size of 111,000) infringe the municipal voter’s right under s. 2(b) of the Charter to cast a vote that can result in meaningful and effective representation. Once the Province has provided for a right to vote in a municipal election, that right must comply with the Charter. In sum, I have found two distinct breaches of s. 2(b) – the first, that the Impugned Provisions substantially interfered with the candidate’s right to freedom of expression when it changed the City’s electoral districts in the middle of the election campaign; the second, that the Impugned Provisions substantially interfered with the voter’s right to freedom of expression when it doubled the ward population size from a 61,000 average to a 111,000 average, effectively denying the voter’s right to cast a vote that can result in effective representation. Bill 31 will incorporate this provision into all four statutes mentioned in its long title. This wording covers not only Justice Belobaba’s ruling under section 2(b) of the Charter but any possible Charter challenge which the Notwithstanding Clause can prevent. English-speaking Canadians by and large so loathe the Notwithstanding Clause because they associate it with Quebec’s language laws, which they see as illiberal and unjust for promoting a French-speaking society and judging this community more important that the individual autonomy and sovereignty of English-speaking persons in Quebec. More broadly, many Canadians find the Notwithstanding Clause repugnant because it allows legislatures to detract from the modern-liberal political project and temporarily halt the advance of its telos toward absolute individual autonomy and sovereignty. But Section 33 of the Canadian Charter of Rights and Freedoms is just as constitutional as section 2 of the Canadian Charter of Rights and Freedoms. Unlike in modern republics, the constitutions of which draw upon Enlightenment philosophy, the Constitution of Canada is not hegemonic and does not neatly propagate one consistent ideology. In this respect, the Constitution of Canada instead reflects the organic messiness of an evolutionary political tradition that does not lend itself to absolute rationalism; overall, then – and despite the best efforts of Trudeau I in the 1980s – the Constitution of Canada more closely resembles a constitution in the classical and British sense of the word than it does the United States Constitution, which represents and promulgates an all-encompassing Enlightenment Project. A view has also emerged that Notwithstanding Clause should only be invoked in exceptional circumstances and that Ford’s crusade against Toronto’s City Council does not meet that standard and instead comes across as a crass and vengeful powerplay which hints at authoritarian tendencies. Indeed, this is all political – there’s no sense in denying that. But the Ford government should therefore also face the political consequences of having pursued this policy and used the Notwithstanding Clause so aggressively, whatever they may be. The provincial legislatures should not be limited in how they invoke the Notwithstanding Clause within its limits as defined by section 33 of the Constitution Act, 1982. Time will tell whether or how this hurts Ford and whether this whole episode makes him look strong and decisive or petty and vengeful. Tonda MacCharles, “Twenty-Five Toronto MPs Urge Rejection of Ford’s Plan to Use the ‘Notwithstanding Clause’,” The Toronto Star, 13 September 2018. Re: Resolution to Amend the Constitution  1 S.C.R., at para 883-884; Re: Reference re Secession of Quebec,  2 S.C.R. 217, at para. 148; Reference re Senate Reform, 2014 SCC 32 at para 23; Adam Dodek, The Canadian Constitution (Toronto: Dundurn, 2013), 17-18. Warren Newman, “Constitutional Amendment by Legislation,” chapter 5 in Constitutional Amendment in Canada, edited by Emmett Macfarlane, 105-125 (Toronto: University of Toronto Press, 2016): 105. Objection by Quebec to a Resolution to amend the Constitution,  2 S.C.R. 793, at page 806; Hogan v. Newfoundland (Attorney General), 2000 NFCA 12 at para. 64, 73. Canada, Department of Justice, A Consolidation of the Constitution Acts, 1867 to 1982 (Ottawa: Her Majesty the Queen in Right of Canada, 1 January 2001), 74. For instance, it would be unconstitutional (in the English sense), but not illegal, if the Governor were to act unilaterally and independent of any ministerial advice. Russell Kirk, The Roots of American Order, 4th Edition (Wilmington, Delaware: Isi Books, 2003), 66, 83. Martin A. Rogoff, “A Comparison of Constitutionalism in France and the United States,” Maine Law Review 49, no. 21 (1997): 22-83. Re: Resolution to Amend the Constitution  1 S.C.R., at para 874. Conacher v. Canada (Prime Minister), 2009 FC 920, at para. 59. Reference re Senate Reform, 2014 SCC 32 at para 23,  1 SCR 704, citing: Reference re Secession of Quebec,  2 SCR 217, 161 DLR (4th) 385 at paras 32 and 70-78 [cited to SCR]; Reference re Remuneration of Judges of the Provincial Court (P.E.I. ),  3 SCR 3, 150 DLR (4th) 577 at para 108 [cited to SCR]; Constitution Act, 1982, being Schedule B to the Canada Act 1982 (UK), 1982, c 11, s 52(1); Supreme Court Act Reference, 2014 SCC 21 at para 89 [Citations omitted]. Ibid., at para 25, citing Secession Reference, at para. 32; Secession Reference; Provincial Court Judges Reference; New Brunswick Broadcasting Co. v. Nova Scotia (Speaker of the House of Assembly),  1 S.C.R. 319; Reference re Manitoba Language Rights,  1 S.C.R. 721 [Citations omitted]. Reference re Senate Reform, 2014 SCC 32, at para. 24, citing Supreme Court Act Reference, 2014 SCC 21 at paras. 97-100; Secession Reference, at para. 32 [Citations omitted]. City of Toronto et al v. Ontario (Attorney General), 2018 ONSC 5151, at paras 14-16. Reference re Remuneration of Judges of the Provincial Court (P.E.I. ),  3 S.C.R. 3, at paras. 108, 139. City of Toronto et al v. Ontario (Attorney General), 2018 ONSC 5151, at para 19. City of Toronto et al v. Ontario (Attorney General), 2018 ONSC 5151, at paras 20-21. City of Toronto et al v. Ontario (Attorney General), 2018 ONSC 5151, at para 46. City of Toronto et al v. Ontario (Attorney General), 2018 ONSC 5151, at para 4. This entry was posted in Amending Formulas, Constitution (Conventional), Constitution (Written), Notwithstanding Clause, Separation of Powers. Bookmark the permalink.